Who doesn’t love chocolate? 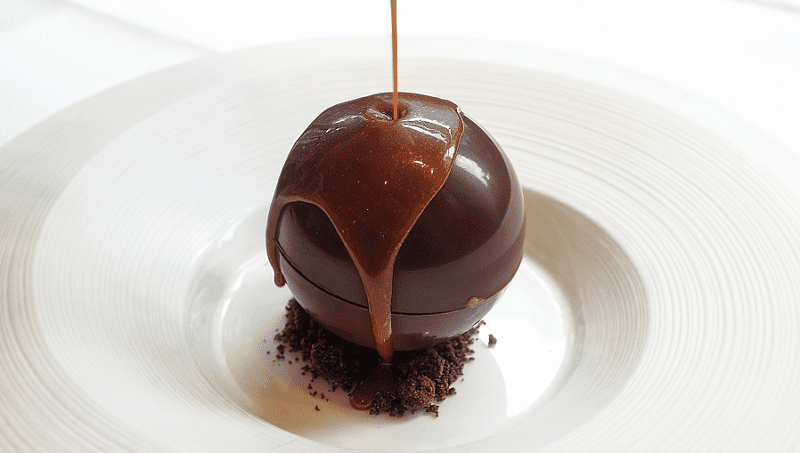 This holiday season we have rounded up the best desserts for chocoholics. Melt the butter and chopped chocolate in a medium saucepan on medium heat, stirring constantly, about 5 minutes. Remove from the heat, pour into a large mixing bowl, and allow to slightly cool for 10 minutes. While the chocolate mixture is cooling, make the peanut butter filling. In a medium bowl, beat the peanut butter, sugar, vanilla, and milk together on medium-high speed until combined. The mixture will be very thick – like a crumbly cookie dough. Set aside. Pre heat the oven to 350F degrees. Line the bottom and sides of a 9×9 inch square baking pan with aluminum foil. Whisk brown sugar into the cooled chocolate/butter mixture. Add the eggs. Whisk in the vanilla. Gently fold in the flour, cocoa powder, and salt. Pour/spread half of the brownie batter into the prepared baking pan. Take large chunks of the peanut butter filling and flatten with your hands. 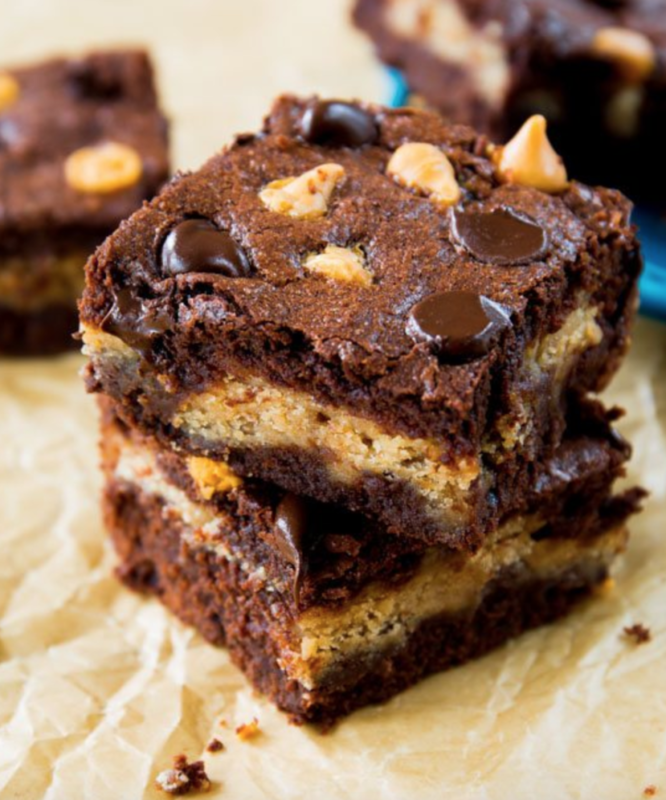 Place flat pieces in an even layer on top of the brownie layer. Pour/spread the remaining brownie batter on top. Top with the chocolate chips and peanut butter chips. Bake for 35 minutes. Allow the brownies to cool completely in the pan set on a wire rack. Place a rack in lowest position in oven; preheat to 375°. Coarsely chop chocolate, leaving several wafers whole; set aside. Mix brown sugar, granulated sugar, butter, and salt in a large bowl. Stir in egg and vanilla. Add flour and baking soda and mix until dough comes together and no streaks remain, about 30 seconds. Stir in ¾ cup chocolate, reserving remaining chocolate, until evenly distributed. Scrape batter into a 10″ cast-iron skillet. Pat batter into skillet with damp hands, pressing into an even layer so dough extends to sides of pan. Scatter remaining chocolate over cookie and sprinkle with sea salt. Bake cookie until outer edges are browned and slightly puffed, 20–25 minutes (15–18 minutes for stainless steel). 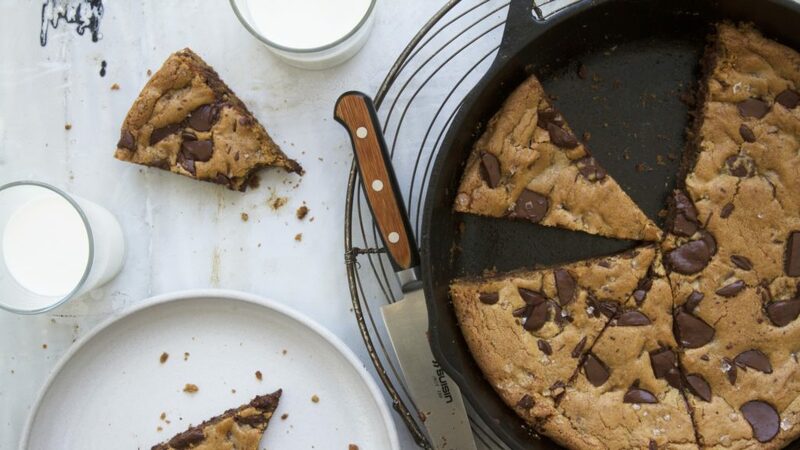 Let cool in skillet 1 hour (if you can resist). Serve in skillet or turn out; cut into wedges. Serve with vanilla ice cream.